Matt Chwierut is research director at Smith + Crown, a research and data group focused on crypto-finance and blockchain technology. There, he works alongside Sid Kalla, CFA, a researcher and journalist focusing on cryptocurrencies. 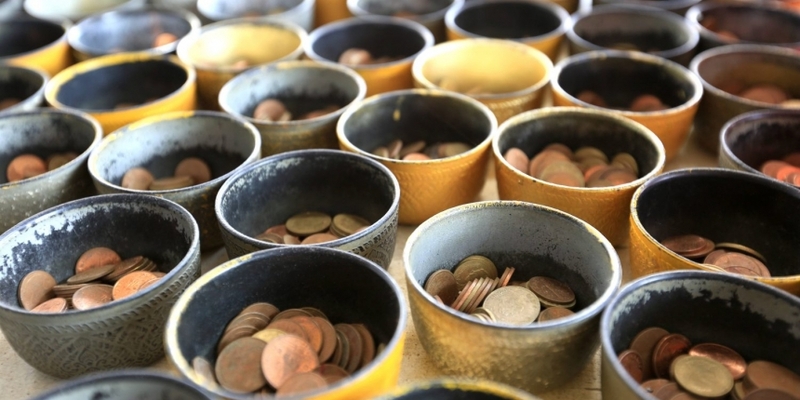 In this CoinDesk 2016 in Review special feature, Chwierut and Kalla recap the year in ‘initial cryptocurrency offerings’ – a new form of fundraising that is gaining popularity in the blockchain industry. You may have missed it in 2016, but initial coin offerings, or ICOs, have become the dominant way to fund new cryptocurrency projects. In an ICO, a project sells part of the total token supply to early adopters in exchange for money with which to progress. ICOs have two primary benefits: they provide funding to the team to see the project through, and incentivize a community to contribute (who gains if the project succeeds and the tokens are worth more than they bought them for). 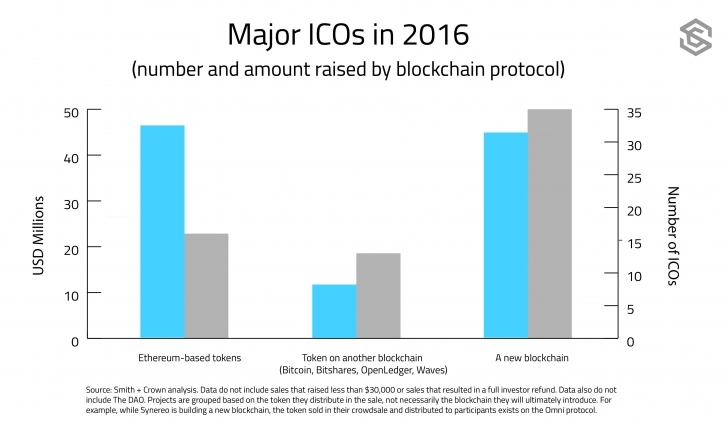 Although 2016 witnessed a high number of ICOs, they are not a new phenomenon and some ICOs from earlier than 2015 include well-known projects like ethereum, Factom, Augur, NXT and Mastercoin. 2016, however, saw unusually high activity in the ICO space, both in terms of total campaigns that raised money, and also in terms of the total number of investor dollars. In addition, we believe that certain trends that started in 2016 will likely define and shape ICOs going forward. As a quick reader note, we would like to mention that we have removed The DAO from our analysis because it didn’t fit into the regular ICO model, given that investors still retained some level of control over their funds and how they would be spent. In 2016, we saw several projects funded with an ICO that had a business model with actual earnings. ICO token holders would be rewarded with ‘dividends’ when the underlying project or company gained traction. Note that these ‘dividends’ come from underlying earnings, not from inflation, which is the source in regular proof-of-stake cryptocurrencies. With this development, for the first time, we were able to provide a valuation model for these cryptocurrency tokens, since their value could be computed beyond mere speculation. The value for these tokens will ultimately be backed by the cash-flow generated by these projects. Although the final value is heavily dependent on the accuracy of the assumptions made in the model, investors can plug in different numbers in their own model and come up with their own ranges of value. ICONOMI ($10m): A project that aims to create crypto-index and hedge funds, and an open-fund platform for other investors to host their fund-management. SingularDTV ($7.5m): A project, the first ICO from ConsenSys, that aims to provide a documentary and TV series, along with a digital rights management platform. We created sample valuation models for these projects for investors to use as a starting point (see sample analysis of ICONOMI). This uses tools used in the existing financial industry to value companies, and can be a convenient starting point for investors to make decisions on whether to invest in these ICOs or not. Note that Augur, which had its ICO in 2015 and raised $5m, had also released the Augur tokens for trading in 2016. Augur aims to create a decentralized prediction marketplace. Also note that none of these projects were generating any earnings by the close of 2016, but they are all expected to do so in 2017. Many will be watching as these projects come online and the ICO investors begin to get returns on their investments. Finally, these types of ICOs seem likely to fail the Howey Test for whether they are a security or not and therefore may need more legal and regulatory help going forward. Another important trend that emerged in 2016 among ICOs was the creation of projects on top of existing blockchains, notably ethereum. Several of the ICOs that raised major investment, like ICONOMI, FirstBlood and SingularDTV are projects built on ethereum. In 2016, excluding The DAO, ethereum ICOs raised a total of $46m. The two other ICOs in early 2016, namely Lisk (which raised $6.4m) and Waves (which raised $15.9m) are coming up as new possible platforms for token issuances in the future. Incent Loyalty launched its token on the Waves platform, but ethereum leads the pack. It is also the first time we are witnessing some form of network effects emerge from the nascent ethereum ecosystem. Ethereum also supplies a ready pool of investors looking to allocate capital. The downside is that there can be a frenzy and people may fail to carry out proper due diligence. Many projects fail because they were wildly ambitious, the business model or technology was fundamentally flawed, or they were outright scams. We expect to see this trend continue in 2017, as more ethereum projects come online and issue tokens on ethereum. 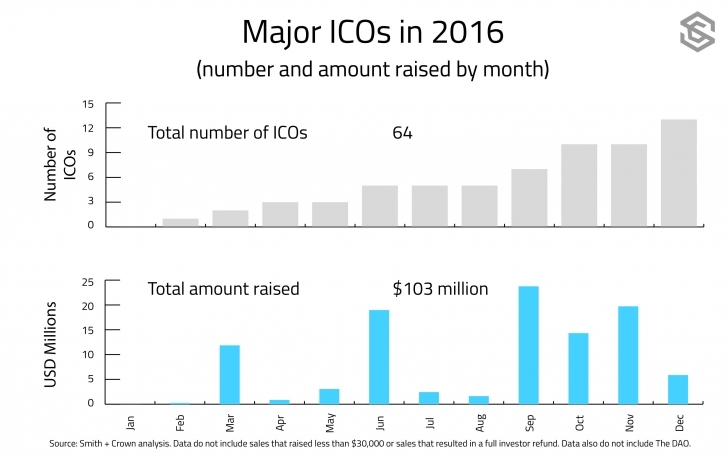 2016 marked some exuberance when it came to investing in ICOs, especially during the year’s middle months. Notably, FirstBlood raised $5.5m, its full cap, in under 10 minutes. SingularDTV raised $7.5m, its full cap in under 15 minutes. Going into 2017, we expect that investors will perform more due diligence and demand a higher bar from projects that attempt to raise money via ICOs. A white paper and an “about us” page will not be sufficient to raise $10m going forward. Instead, investors will ask harder questions about the team’s experience, background, staying capacity, technical capability, real-world business use cases, etc, while also giving a high consideration for the price of these tokens. 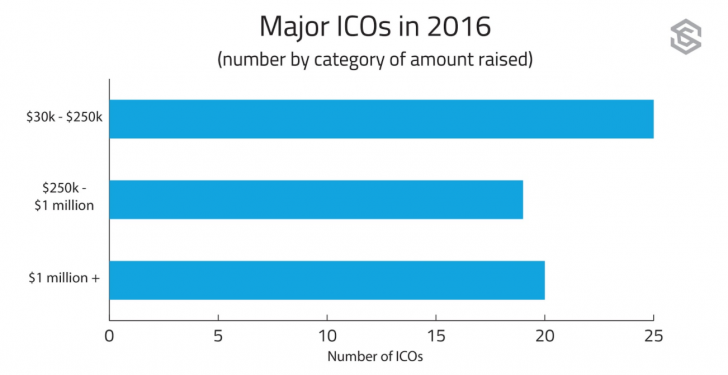 We have noted a few trends seen in ICOs in 2016, but there are also some broader questions that remain for the ICO space that will help the community evolve in 2017. The question of whether to cap an ICO or not continues to divide the community. In 2016, we saw a fair number of ICOs that were capped but sold out almost immediately, within minutes. We are not sure whether future ICOs will prefer a capped or uncapped model. 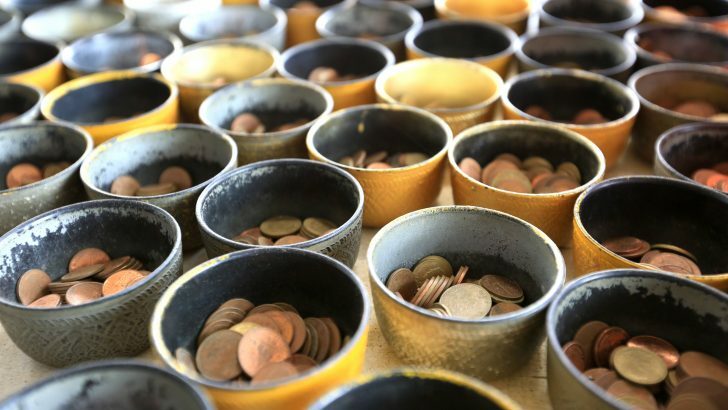 The question of what percentage of ICO tokens should be given up in an ICO will receive more scrutiny. On the one hand, ICO investors may like to own a majority of the tokens. But on the other, if ICOs start competing with traditional venture capital to fund new projects, they might want to follow a similar approach with multiple ‘rounds’. We may see ICOs experiment with new models for raising money. For instance, Gnosis, an ethereum-based project, plans to conduct a Dutch Auction, popular in bond market tender offers. There may also be more questions on which types of ICO tokens may be considered securities by regulators and which ones are not. And we may see some kinds of best practices evolve around the space. Coinbase invested some legal resources and provided a guide for the community and there’s hope the regulatory landscape will keep evolving along with the ambitions of entrepreneurs.